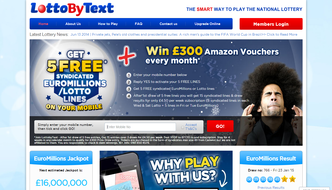 Lotto By Text is owned by Bitstacker Ltd who are a registered company based in England. The site was launched back in 2006. They offer a smart and easy way for anyone aged 16 or above to play the lottery through their mobile phone. 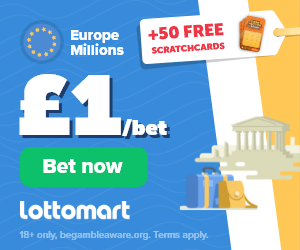 As the name suggests the site runs the first National Lottery / EuroMillions syndicate service which can be played through your mobile or smartphone without needing a credit or debit card. This site is great for people who want to play the lottery in an online syndicate but don’t have access to a credit or debit card. When you sign up simply enter your phone number and your lines are sent directly to your phone via text message. Visit the site today, enter your mobile number in the box provided and reply yes to the text message that you are sent. By doing this you will get 5 free syndicated entries into the next EuroMillions draw. You are also entered into a special prize draw to win £300 in Amazon vouchers each month. After the first draw is over if you decide not to continue a subscription with them simply text ‘stop’ to 87770. If you do decide to continue then you will be charged £4.50 per week for 5 syndicated lines into the Wednesday and Saturday National Lottery draws each week. You will also get a further 5 EuroMillions lines for the Tuesday or Friday weekly draws. The £4.50 is payable by reverse SMS billing (Text message) so will be charged to your mobile bill if you are on a contract or taken from your credit on pay as you go. By playing at this lottery site you substantially increase your chances of winning a prize as you are entered into each draw with other players in a syndicate. It’s a fact that 1 in 4 jackpots are won by syndicates. Each Syndicate at Lotto by Txt is limited to a maximum of 49 players. If you win a prize you will split your winnings equally with the other members of the syndicate. 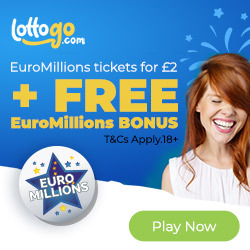 You can view your lotto numbers at any time by logging into your member’s area. Once you have collected 500 Lotto Reward Points a button will appear in your account area allowing you to redeem them. For 500 points you can claim a £5 Amazon voucher or 25 free syndicate Lotto lines. For anything above 500 you can claim your points in 100’s for an extra 5 syndicated Lotto tickets. You must pay by text message (reverse SMS billing) through your mobile to play through the text syndicate. You do have the option at any time to login to your account and upgrade to an online account. By upgrading to online you will get 10% off future subscriptions plus a free £5 Amazon voucher when you sign up. With an online account, you can pay your subscription costs using any major credit / debit card. To make a claim simply login to your member area and enter your claim reference number from your text message. Your winnings must be over 60p to cash out, any lower amounts can be put towards future tickets. Once you have over 60p you can request a cheque which is sent within 5 – 7 days. Alternatively, you can collect your winnings from the Post Office. This is much quicker than the cheque method as will only take 2 – 3 days. If you win over £1000 then you must contact their customer support team who will run through the process with you. It’s not possible to get your winnings sent back to your mobile phone account.